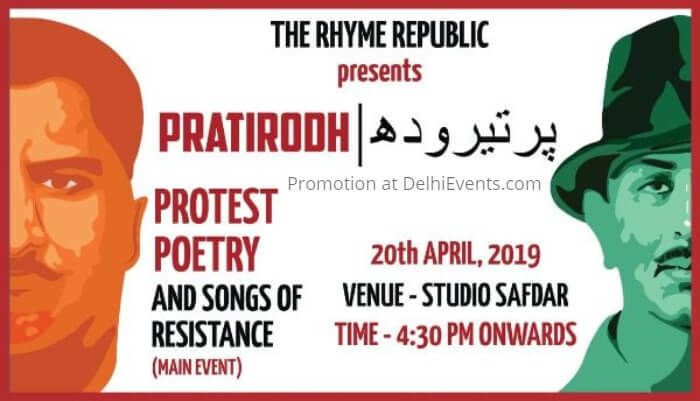 Event Description : POETRY : The Rhyme Republic presents "Pratirodh - Protest Poetry And Songs Of Resistance"
The Rhyme Republic's poetry event 'Pratirodh: Protest Poetry and Songs of Resistance' is the second instalment of our series of protest poetry events in the capital. After the first Pratirodh event at the JNU campus which was held in Solidarity with JNUSUs hunger strike. The Rhyme Republic intends to keep the spirit of revolution and change high and fulfil its responsibility as a poetry collective to society.